This doesn’t quite mark the end of laptops and desktops. But just so you know: people all over the world are searching the Web using their smartphones and mobile devices more than ever. According to market research firm Statista and social media news site Mashable, 17.4 percent of all Web traffic in 2013 has so far come through mobile devices (smartphones and tablets). This marks more than a 6 percent increase from 2012, when 11.1 percent of global Web usage came from mobile. What does this mean for you as a local business owner? It’s time to make a mobile version of your website. A lot of people are obviously searching for local information while on the go. That’s why it’s important for you to have a mobile-friendly website: it ensures that your business appears on mobile search results as well as delivers a smooth navigation experience for potential customers. You should manage and monitor online reviews of your business. User-generated reviews on sites like Yelp, TripAdvisor, Google, and Foursquare are visible not only on mobile browsers, but also on the individual mobile apps dedicated to these sites. These reviews happen to have high word-of-mouth potential. Keep an eye on your online reputation and manage it well, so that you can gain a competitive advantage in the eyes of people who use their mobile devices to search for information. It’s critical to publish your business information online and keep it up-to-date. Let’s say people found out about you via mobile search. In this case, they’ll be a click, a phone call, a map direction, and a review/ star rating away from interacting with – and possibly buying from – your business. This is why it’s so important to keep your local information updated: phone number, website URL, address and map location, review profile, etc. Wrong local data means missed opportunities – and can cost you dearly. 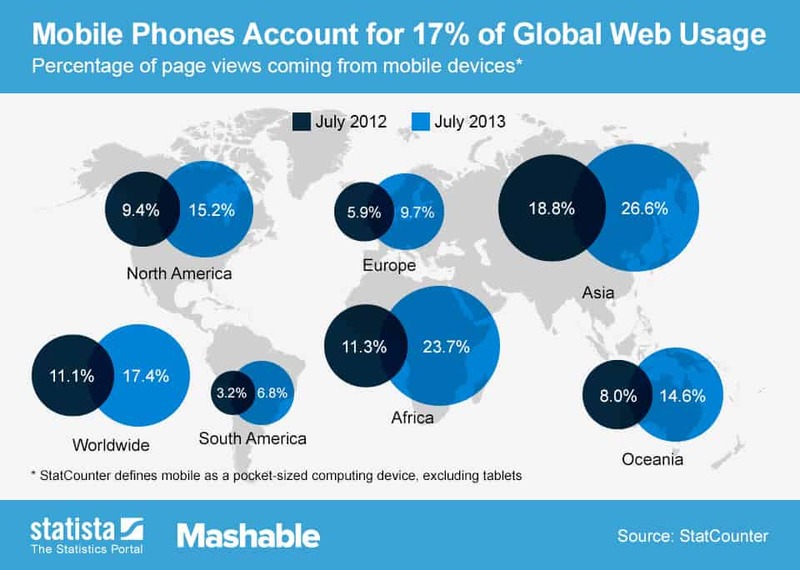 Check on the infographic below for more information on global mobile Web usage.